Bell's theorem, also called "Bell's inequality," is a thought experiment. When joined with real experiments it shows there are no hidden variables which can explain some of the consequences of quantum mechanics. This study, closely related to quantum mechanics, was done by John Stewart Bell. The following analogy has been provided by Brian Greene: Pairs of boxes have been prepared and sent to Earth and on Vulcan. There is something inside that shows a light when a door is opened. If the same doors are opened on both members of the pair, then both lights will be blue or both lights will be red. What if different doors are opened? Maybe the chances that a red light or a blue light shows up were set by the maker of the boxes. Or maybe whether a red light or a blue light shows up depends on an individual coin flip in each box. How can we tell? In a system that works the way quantum mechanics does, there is a 50% chance that opening any pair of doors (on the gray side, the white side, or the black side of each of the boxes in the schematic diagram) will give rise to a match. 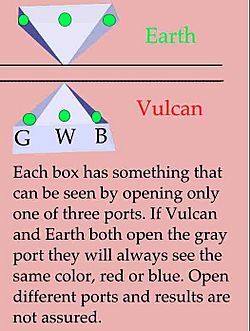 For instance, Earth could open the door in the gray side of its box, and Vulcan could open the door in the black side of its box. Quantum physics says that half the time they should get a match. But if the decision to produce a certain color for each of the doors opened is programmed into both boxes, then there is a 55% or greater chance of getting a match. Bell argues that because in actual experiments doing the equivalent of "opening different doors" only yields a 50% success rate, there can be no hidden variables in operation that would have "preselected" states for all six alternatives. The analogy given here follows closely the one used by Brian Greene in The Elegant Universe, p. 107ff. Bell's theorem Facts for Kids. Kiddle Encyclopedia.